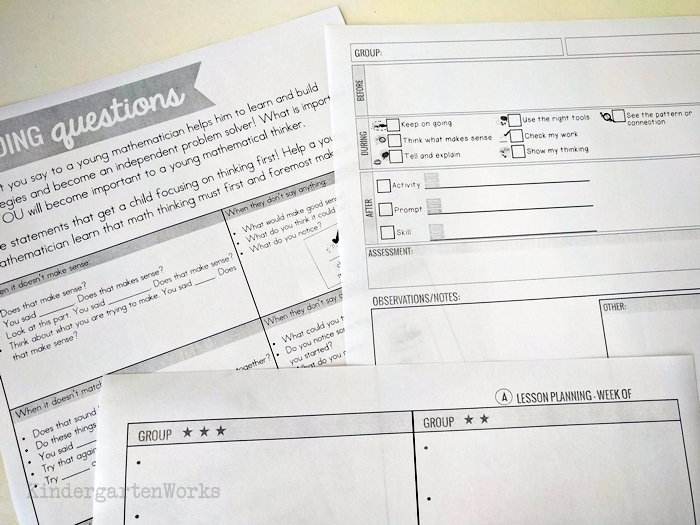 How to teach math in small groups looks different for each teacher due to personality, teaching style, grade level and a group of kiddos. Here is how I create a guided math binder to help me stay on top of lesson planning for my four kindergarten math groups. For some, teaching guided math in kindergarten seems like a daunting task. It can be difficult, but with goals in mind it’s a great and sure fire way to meet the needs of your students. If you want to differentiate math, then guided math is for you. 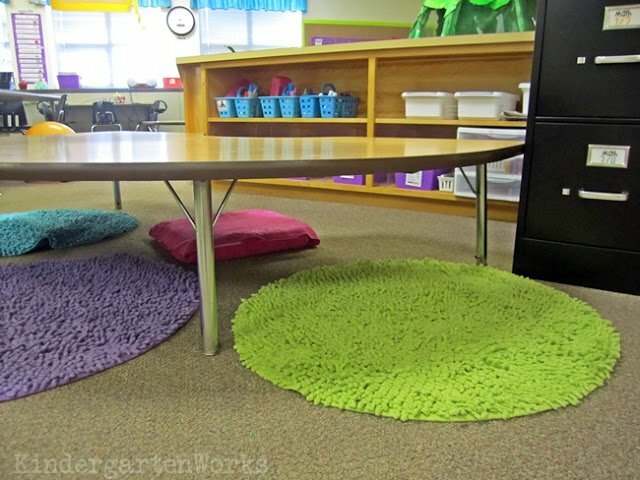 First, let me begin by showing you my guided math space. 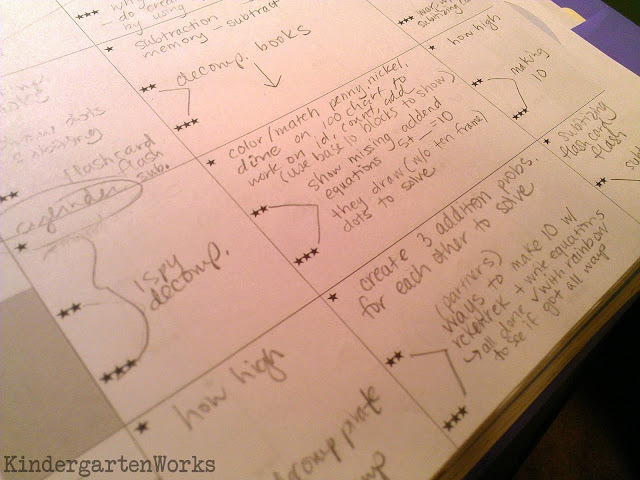 This lesson plan binder is the piece that holds it all together for me. At the front, before any tabs, I keep the planned scope for the quarter’s nine weeks as a planning guide. Scribbles, scrawled handwriting, it’s all part of my process. It shows me what standard and activity we can use and how to differentiate for groups. I also have a teeny version of the weekly rotation taped into my binder for planning reference. Behind each of the four binder tabs (one for each math group), I have a new set of weekly lesson plans for my groups. I plan/print one week at a time onto the single page layout with lots of space to scrawl notes. I print these double sided since I meet with each group twice a week – one sheet works for a week and doesn’t make my binder too heavy or huge. The top has a place for me to write down vocabulary, our main lesson format, which strategy we’re focusing on (which Mathematical Practice standard) and any wrap up or assessment piece. 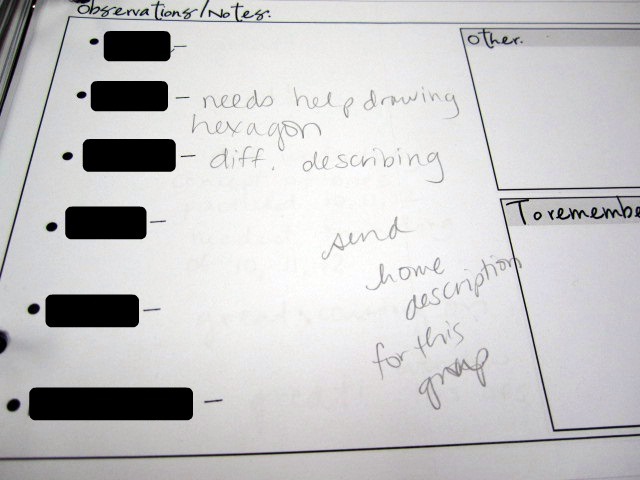 Each lesson plan page has room for me to jot notes and document what we do and what I notice with my kinders. I use a very similar type of page for my guided reading plans. I figure if I need RTI documentation, bring it on! The blacked out portions are the names of the students in this group. The entire bottom portion allows me to stay on top of what my kinders are doing, thinking, learning. I have a master copy of the lesson plan template for each group, so I don’t have to re-write the names every week. And the side portions? Well, that’s where I write down anything for me. Sometimes it is a note on other students and how they are performing when not with me in the teacher zone, or I jot down where to take this group next time. Sometimes, I may have the tendency to forget to pull an item before the lesson, so I boldy remind myself to get it right then and there. It’s a pretty straightforward binder. Long term plans in the front and daily plans behind each group’s tab. But it works! 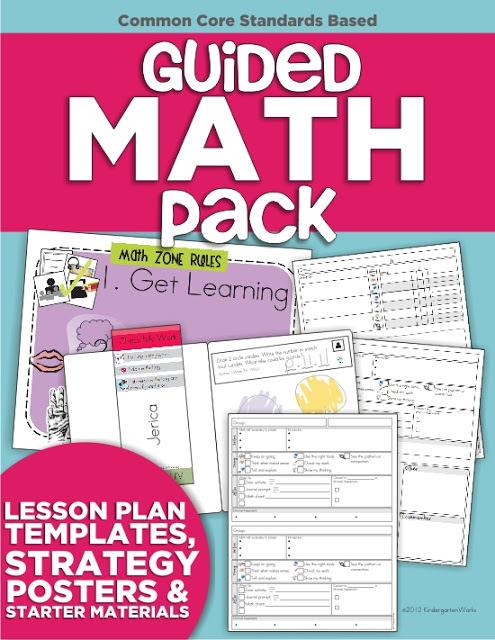 I’ve put together all of the math lesson plan templates into a guided math pack along with tons of other goodies to help you get your guided math binder started. 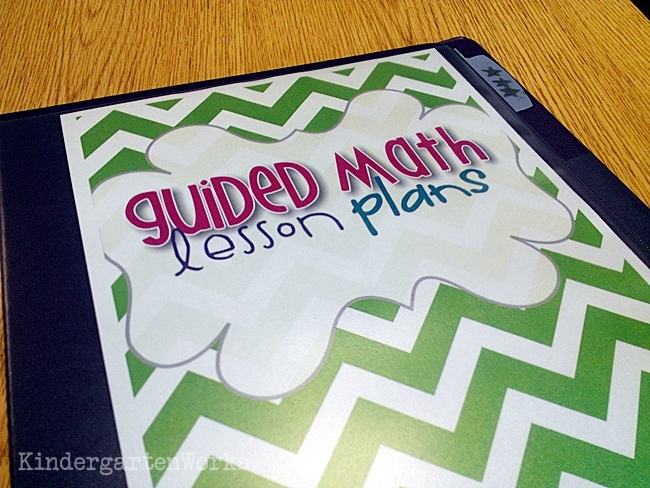 Do you use a guided math binder? What does yours look like? Thank you so much for this post. I think it will help me focus a bit more on the organization of my guided math. You’re welcome. Once you get a good system in place it can last all year long! I am getting ready to start guided math this upcoming year with my kinders and I am trying to get myself organized. I was looking for the cover that you use for your guided math binder but I cannot seem to find it. I purchased the guided math pack on tpt but it wasn’t in there. Thanks for your help! Oh that one is one I just made for myself. Here is a link to it:https://dl.dropboxusercontent.com/u/26192974/KWorks/Binder-Covers/Guided-Math-Binder-Cover.pdf I’ll be sure to add that to the next revamping of the GM pack. Thanks for sharing that that is something you’d like to have added. All the best as you get yourself organized for starting guided math – so exciting! !